Apple packed, slightly sweet with a hint of bourbon, this Apple Pie is gluten free + vegan, but you’d never know it. A tender-flakey coconut oil pastry with an easy cut out top crust makes this Apple Pie simple to assemble and fun to share. Apple pie for everyone! Hooray! | Disclosure: This post is sponsored by Bob’s Red Mill. Thank you for supporting brands that keep Vanilla And Bean cookin! I was reminded anything worthwhile takes time, as I researched, developed and tested this gluten free vegan Apple Pie recipe. I knew it was a recipe I wanted to tackle, and after running a poll on Instagram, it was confirmed. And so the journey began. By the fifth pie, lots of eating pie, giving away pie and freezing pie, I finally got it right. The texture of the apples, exacting spices, a hint of bourbon and a tender pastry that is gluten free and vegan finally came together. With the help of Bob’s Red Mill Gluten Free 1-to-1 Baking Flour, and familiarity with coconut oil pastry, the pie dough comes together with ease. It was the filling and baking that gave me fits. First, it was the overflow of juices from the sugar and apples that worked its way out of the pie while baking. While a little is okay, overflowing is not! Next, the dreaded gap emerged that sometimes develops between the pastry and apple filling after baking and cooling, an aesthetic that cannot be ignored. Last, the texture of the apples after baking and cooling, went from being too crunchy to mush. Good news is I never dealt with a soggy bottom. A problem sometimes experienced in fruit pies. And so I read, tested, and read more about this dreaded gap and other issues. 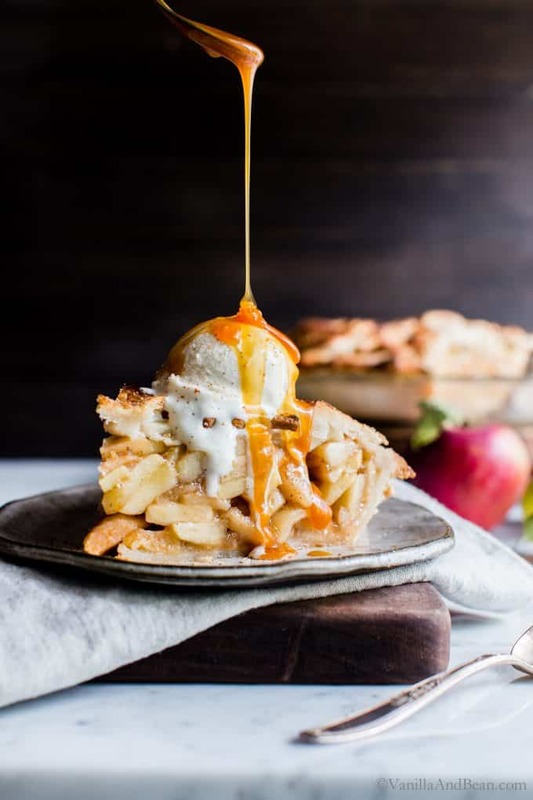 Some said the gap is caused by the type of fat used in the pastry, others suggested macerating the apples, capturing the liquid, cooking the liquid down then thickening the liquid with starch, and adding it back into the apple filling prior to baking. Then, suggestions of cooking the apples prior to filling the pie using varied techniques. And of course, these different techniques all had an effect on the final texture of the apples. In the end, it was tips from Samin Nosrat, author of Salt Fat Acid Heat, Amy Traverso’s The Apple Lover’s Cookbook and also Cook’s Illustrated that helped me bring this recipe to a winning conclusion! What are the Best Apples to use in Apple Pie? Choose a mix of firm, tart and sweet apples such as Cortland, Granny Smith, Honey Crisp, Gravenstein, Cameo, Jonagolds or Pink Lady. These varieties tend to hold their structure well in Apple Pie. Using a mix of at least three different types of apples yields flavor interest, texture variety and a lovely fragrance. For this pie, I use Granny Smith, Gravenstein and apples from my neighbor’s tree, an heirloom variety of Golden Delicious. Make the pastry in a food processor. While the dough is resting, make the apple filling. Peel, cut, core and slice the apples thin. Mix with sugar, spices, vanilla and bourbon then gently cook the mixture in a large Dutch oven or stock pot. Toss the cooked apples on a baking sheet to cool. Meanwhile, roll out the dough, place and shape it into a pie plate. Strain and transfer the apples to the uncooked pastry. Straining the apples helps insure little to no leakage or overcooked apples. Roll out the dough for the top crust, cut out various shapes and arrange over the apples leaving gaps between the cutouts for steam to escape. Freeze the pie for 15 minutes. Brush the pastry with nut milk, sprinkle with a cinnamon sugar mixture and bake. How do you Prevent the Gap Between the Apples and Pastry? To prevent the dreaded gap, there are a few steps to take prior to tossing the apples in the pie pan. Gently cooking the apples helps set the pectin, bringing it to a heat stable form. This prevents further cooking and dreaded mushiness (or further apple shrinkage). Cook prior to baking for 10-15 minutes. Spread apples and juices on a sheet pan and place in the freezer to quickly cool to room temperature. Now they’re ready for the pie pan. Strain the sugar and spice mixture off the apples after cooling. Doing this reduces moisture and steam build up under the crust, which can also further cook the apples making them too soft. Straining also prevents an overflow of apple juices spilling over and onto the baking pan. Make sure there are plenty of steam vents in the top crust for steam to escape. To ensure this, I use a top crust made of pastry cutouts. I use leaves here, but stars or flowers would be festive too. The pastry can be made up to two days in advance and refrigerated or up to two weeks if stored in the freezer (thaw overnight in the fridge). Before working the dough, bring it to room temperature. Coconut oil pastry is easier to handle at room temperature (opposite of everything butter dough!). When working gluten free pie dough, I use parchment paper to initially knead it sans flour. It makes collecting all the bits easier, no additional flour is added to the dough, and there’s less sticking. Use parchment again to roll the pastry out. Working with gluten free and coconut oil pastry is such a pleasure. Although a bit more crumbly then gluten and butter pastry, we don’t have to worry about over developing the gluten, so if rolling it out doesn’t work the first time, the pastry can be reworked and rolled out again still producing a tender pastry. Five pounds of apples seems like a lot, but once they’re peeled, cored, cooked, piled into the pie plate and nudged into place, it becomes the perfect amount for a lovely, mounded Apple Pie. To help prevent a soggy bottom, place a parchment lined sheet pan in the oven while it’s warming. When the oven is ready, the pan will be nice and hot which will transfer direct heat to the bottom pastry. I prefer to use a glass pie plate so I can keep an eye on the bottom crust. Bob’s Red Mill Gluten Free 1-to-1 Baking Flour is a blend of gluten free flours, starches and xanthan gum. 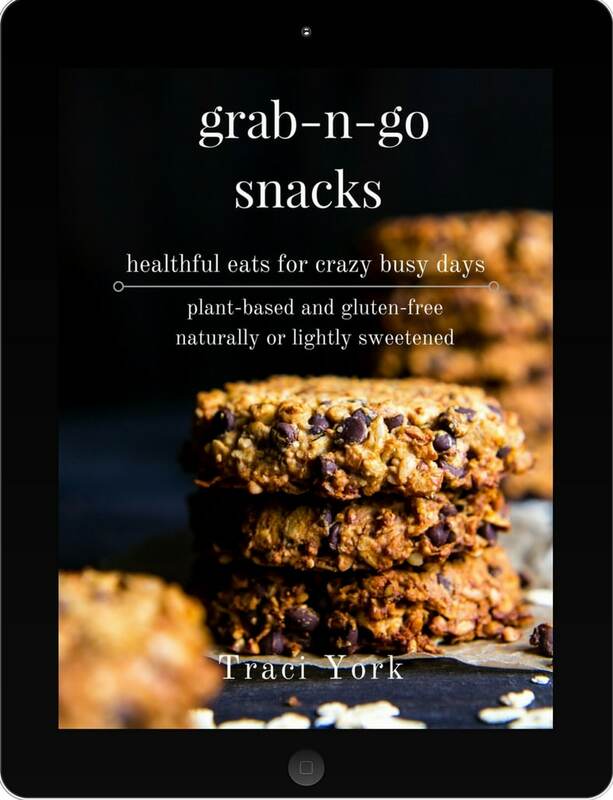 It’s helped me create light and fluffy cupcakes, delectable cookies and a fabulous gluten free pizza crust based on old favorites. Using their Gluten Free 1-to-1 Baking Flour for this Apple Pie is an easy way to still enjoy fabulous pie without gluten. For more recipes using Bob’s Red Mill Gluten Free 1 to 1 Baking Flour and so many other fabulous ingredients head to their website and for daily inspiration, be sure to check out Bob’s Red Mill on Facebook, Instagram and Twitter! Apple packed, slightly sweet with a hint of bourbon, this Apple Pie is gluten free + vegan, but you'd never know it. A tender-flakey coconut oil pastry with an easy cut out top crust makes this Apple Pie simple to assemble and fun to share. Apple pie for everyone! Hooray! *Read recipe notes in the blog post and in recipe notes for additional tips. *Prep time below does not reflect hands off time for things such as resting the dough or cooling the apples etc. Nor does the prep time reflect individual experience/comfort level when working with the ingredients and/or pastry. This can vary widely depending on the individual. Whisk the nut milk and apple cider vinegar together in a spouted measuring cup. Set aside to rest for 5 minutes. Meanwhile in the bowl of a food processor fitted with the S blade, add the gluten free flour, tapioca flour, sugar, and salt. Pulse 5-6 times to combine. Add the solid coconut oil and pulse until chunky, about 7-8 pulses. With the processor running, add the nut milk mixture, holding out about one to two tablespoons and process about 10-15 seconds or until the mixture starts to come together (it will look crumbly). To see if the dough is ready, grab a fist-full and squeeze. It should hold together. If not, add the remaining nut milk, process again and retest until it clumps in your fist. Dump the dough out onto a large piece of parchment paper. Use the parchment paper to work the dough into a pliable piece, press and fold the bits together - folding and pressing the dough over and on top of itself until the dough comes together in one piece. Shape into a smooth thick disk, then divide in half. Shape the two new halves, patting and rounding into a 1-2" thick (2.5-5cm) disk. You want the pastry to be smooth with no cracks if possible. Wrap the pastry in parchment paper or turn a bowl over the top of the of the disks (they can be stacked). The dough should be tacky, not sticky. If the dough is sticky, pop it in the refrigerator for about 15 minutes, then bring it out to room temperature again. Rest the pastry at room temperature while you prepare the apples. Peel, core and slice the apples 1/4" thick (a little over is okay). You'll have about 16 C (1.5kg) of apples after slicing. Use your hands to gently toss the apples with the sugars, bourbon if using, cinnamon, nutmeg, salt, vanilla paste or vanilla extract, and lemon juice. Place the apples and juices into a large heavy bottom Dutch oven or large stock pot and cook on medium, gently stirring frequently, allowing the juices to simmer for 10-15 minutes. The apples should be just fork tender. I prefer a tender crisp apple so I cook for about 11 minutes. For a softer set, cook for 13-15 minutes. Remove from heat and gently stir in the corn starch. Pour the apples and all their juices onto a parchment lined sheet pan and spread the apples into an even layer. Place in the freezer for about 12-15 minutes to cool to room temperature. Set aside. While the apples are cooling, melt a bit of coconut oil and brush onto the bottom, sides and edges (very important (!!) get those edges) of a 9" (22cm) pie plate (I prefer glass* - see note). Roll out the pastry between two sheets of parchment to about 1/8" (3mm) thick - no thinner and about a 12" (30cm) circle. Sometimes I add a sprinkle of water (1/4 tsp) over the pastry if there's too much cracking. Gently remove the top parchment piece and using the rolling pin, roll up the pastry with the bottom layer of parchment in tact. Flip the pin over so that the pastry is now facing the pie plate, center the pastry and gently unroll. Carefully remove the parchment that is now on top of the pastry. There will be some breaking. Gently form the dough into the pie plate. Trim the edge of the pastry to about 1" beyond the edge of the plate. Tuck the pastry edges under as best you can, patching any thin areas with dough that has broken off (think play dough). We want the dough to be of about the same thickness all the way around. A dab of water here and there will help smooth any rips, tears or rough edges. Also, if there are any tears in the pastry inside the dish, patch those up with a dab of water and a small piece of pastry where needed. Crimp the edges into a pretty shape. Here's a tutorial, it's not gluten free, but it works as long as your dough on the edges of the pie plate are built up (remember play dough). Start at 33:00 for the rope crimp. Run a knife around the outermost edge of the pastry to trim off any excess being careful not to cut into the crimping. Set aside at room temperature while you roll out the top crust. Roll out the top crust between two pieces of parchment to about 1/8" (3mm) thick. Gently remove the top parchment, sprinkle a bit of flour over the top and cut out shapes using a cookie cutter or knife. Brush off any flour that remains on top of the cut outs. Set aside at room temperature. Strain the apples, shaking the apples to drain off juices. Discard the juice. Pour the apples into the pastry lined pie plate. Nudge the apples into the pastry, arranging them so that there are few gaps between apples. Arrange the curved sides of the apples along the edges as best you can to maximize space. Use your hands to gently press the apples down, wiggling and nudging, while creating a smooth dome. Gently lift the pastry cut outs with an offset spatula, and arrange one at a time on top of the apples. There should be some overlapping, so use a dab of water to 'glue' the pieces of pastry together. We don't want any sliding off the pie. Arrange the cutouts in a decorative pattern leaving gaps between as steam vents. Place the pie in the freezer for about 15 minutes. Meanwhile, set an oven rack in the center of the oven and preheat to 425F (218C). Set a parchment lined sheet pan on the center rack while the oven preheats. Just before the oven is ready, pull the pie from the freezer and brush the pie with nut milk making sure to cover the edges and all the cut outs. Mix the cinnamon and sugar and generously sprinkle over the pie. Bake the pie on a preheated parchment lined sheet pan in a 425F oven for 45-55 minutes rotating the pan 1/2 way through baking. If the pie begins to get too dark on the edges or top, cover the edges with foil or a pie protector. For the top, tent a piece of foil with a hole cut in the top for a steam vent. The pie is done when it's fragrant, the pastry is golden brown (some dark edges are okay) and you can see a bit of the juices bubbling in the center. Cool the pie completely, at least two hours, before cutting or covering it. A practice in patience. Just before cutting the pie, ease the edges of the pastry from the pie plate by running a pairing knife all around the edge. Then, set the pie in a shallow pool of hot tap water for one minute. This allows the fats to soften, making it easier to cut and release from the bottom. Rewarm individual slices in a 350F (180C) for about 15 minutes. Serve with ice cream and your favorite caramel sauce. Store apple pie covered, at room temperature for up to two days. It's best rewarmed as it refreshes the pastry and makes it crisp again. Otherwise the pastry will soften as it sets. What Type of Pie Plate to Use: I use glass, mostly, and for this recipe I prefer it so I can keep an eye on the crust. However, a note of caution about putting a pie in a glass pan just pulled from the freezer on a preheated pan for baking. After making this recipe and others using this technique, I had a fleeting thought about thermal shock and the possibility of a glass pie pan cracking. I've not had this happen in a Pyrex glass pan, but it is something to be aware of. Use a metal pie plate if this is of concern. What Apples to Choose: Choose a mix of firm, tart and sweet apples such as Cortland, Granny Smith, Honey Crisp, Gravenstein, Cameo, Jonagolds or Pink Lady. These varieties tend to hold their structure well in Apple Pie. Using a mix of at least three different types of apples yields flavor interest, texture variety and a lovely fragrance. For this pie, I use Granny Smith, Gravenstein and apples from my neighbor's tree, an heirloom variety of Golden Delicious. A Note on Freezing: I've frozen individual slices of this pie after baking and completely cooling. Store in a lidded container for up to two weeks. Thaw at room temperature and reheat in a 350F oven for about 10-15 minutes. Tried this recipe and while the instructions are very well organized, it would have been helpful to have some step-by-step pictures with it, especially when it came to the second half of the recipe (i.e. rolling out the dough over the pie plate). I also ended up with extra apple slices – did you measure yours using a scale? I followed the 16 cup measurement but it ended up being double the amount of apples I actually needed. Could I freeze the leftover apple slices? That being said, the crust turned out beautifully, almost no cracking which is amazing for a gluten free crust. Hello! Thank you for your note and feedback. So happy to hear you enjoyed the crust! For prep time, I do my best to get as close as possible to the exact time as I can, but unfortunately I’m unable to account for comfort/skill/experience/issues that may arise for any individual, especially when it comes to shaping pastry or decorating cupcakes for example. The prep time reflects hands on time only, not hands off time, like cooling the apples or resting the dough. Regarding the apples, you’ll notice weight and volume measurements in all my recipes. This is because I weigh (using a digital scale) and measure each ingredient. 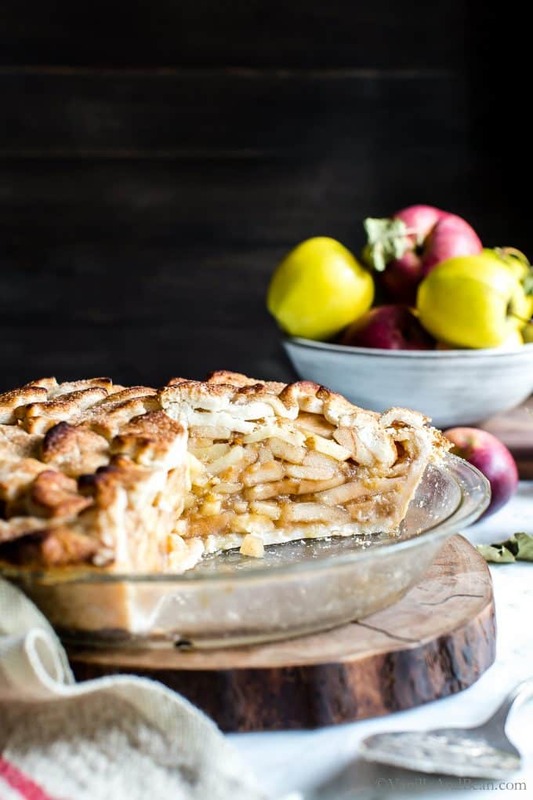 According to King Arthur flour (which is reflected closely in my recipe as well): “A pound of apples will yield 3 cups; so for 8 cups prepared apples, you’ll need about 2 2/3 pounds whole apples.” All the apples go right into the pie plate, there should be no leftovers. Gently wiggling, nudging, arranging and pressing the apples into place should produce a mounded and packed apple pie. The reviews I’ve received on social didn’t have any leftovers, so I’m stumped. The leftover apples can be frozen. I hope this helps! What a gorgeous pie, Traci. My nephew can’t have gluten, so I’m always looking to bake something good for him. It’s a struggle, usually. I can’t wait to try your recipe! What are you drizzling on top od this beauty? Wow! This is a gorgeous apple pie, Traci! I’m really impressed with your extensive testing – and making this pie a winner. Such great shots as usual. And I just started watching Salt Fat Acid Heat on Netflix. Pinning to share! Not only is this a work of art, Traci, but wow, what an incredible amount of work and patience that went into perfecting it. Plus writing this post! A masterpiece, Traci! All I can say is just WOW! I know how much work went into making this recipe throughly foolproof. My hat is off to you my friend. Looks and sounds out of this world. Yummy, your pie does look so delicious. Being more of a cake baker than pie I often shy away from making them. I have noticed with apple pie my filling can be either too soft or crunchy…and the right consistency seems most important with apple pie. I use a mix as recommended but wonder if that is part of the problem as some apples will lose their structure more quickly? However I will try again, do you ever recommend pre cooking some apple slices? Or shoud I stick to peach pie or chocolate cream? LOL. Thank you so much! It seems cake and pie are each their own art form for sure. I find pie, always a practice in art and patience, in a good way. Through this process I found pre cooking the apples key in determining the outcome of the pie. Additionally, the types of apples used. I found the mix of apples I used in this to be adequate. The heirloom Golden Delicious weren’t as sturdy as the others, but they held up good enough and offered an additional layer of texture. Plus they’re ultra local :D The recipe calls for precooking the slices. That is one of the keys to a no gap apple pie! Happy Holidays to you too! Traci, this looks beautiful! I can’t wait to try it. You take the most lovely photos of your amazing creations. Thanks for all the details, too. Happy Thanksgiving! Hi Lori! Thank you for your note and kind words. Happy Thanksgiving to you too! What a gorgeous pie and such helpful hints and detailed recipe instructions. I always top my apple pie with leaf cutouts as well, just wouldn’t be a Thanksgiving pie without those! Years ago I used to trace actual leaves for the lattice top before I had the cutters! Enjoy your Thanksgiving and all that it encompasses. The details… the details! Sometimes I think they may be my end – lol! Love the cutouts too and they’re just so darn easy. Tracing and cutting out leaves… how gorgeous, Jean! Happy Thanksgiving to you and yours… and thank you too for your support and encouragement. So beautiful, Traci!! This pie is clearly perfection! Clearly it looks like you’ve mastered this pie Traci! It’s absolutely GORGEOUS! I love the cut outs on top! I’ll need to make a gluten free dessert for my niece this Christmas, so I know what I’ll be baking! Vanilla and Bean to the rescue! And you know I’m a HUGE Bob’s fan too. I’ve used Bob’s Gluten-Free Baking Flour and love it. Can’t wait to give it a go! Thank you so much Mare! It was such a journey… who knew? I’m a big fan of cut outs… and although I like lattice, it can be a little finicky using GF dough. Plus cutouts are so much fun (and more approachable!). You’re going to spoil your niece with this one! So grateful for Bob’s flours too!